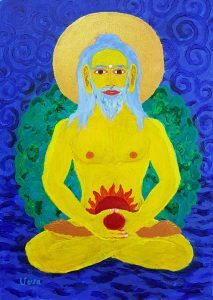 Energy of Ratnasambhava is in Spleen. An Immeasurable Feeling – Patience. The fundamental teaching – of Death. 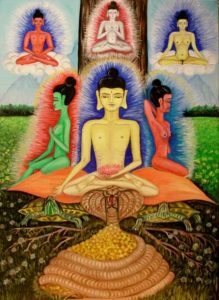 Buddha Ratnasambhava is the Buddha who occupies a central position in many mandalas as it symbolizes the Earth element – the central element. His Immeasurable Feeling is Patience. He has the character of detached philosopher, cemetery ascetic. 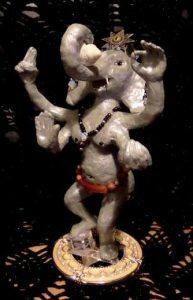 He may be depicted decorated with jewels, but precisely because these jewels are the result of detachment from worldly thinking and lifestyle. He expresses the energy of taking the knowledge of Death as a guide for life. The only thing one knows for sure – is that he will die. When death is our guide to life, we are able to make the right and sober decisions. We know what’s worth it and what’s not worth it to invest our powers into. Spleen is a graveyard of dead blood cells (symbol of death). Jewels that Ratnasambhava is decorated with are jewels that remain after burning the corpse of our selfishness. His Immeasurable Feeling is Patience (restraining of mind) and it develops best when you stand in front of the unknown. 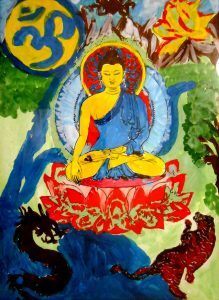 Meditation is a containment/restraining of mind. 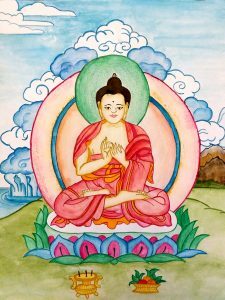 Ratnasambhava teaches us the proper containment of mind. By restraining the mind, the ascetic curbs it. And there is nothing that would have restrained a person’s mind more than thinking about the unknown hour of death.